FREE Gourmet Taco Coupon on Chicago Tribune 11/13 | A Savings WOW! 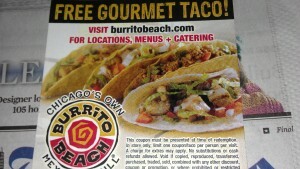 If you got the Chicago Tribune today, check the front page for a coupon for a FREE gourmet taco at Burrito Beach. The coupon may be available depending on the region.